Many of your younger students do not believe that air around us has mass or weight, let alone exerts pressure on us and on everything around us. So, the idea that the atmosphere in which we walk actually has mass and can exert pressure on our world may seem completely ridiculous to many of your students. The story itself, however, is a type of formative assessment, and a discussion about the various opinions given will provide you with valuable information on what the students believe about the air that surrounds them. This free selection includes the Table of Contents, Introduction, and Index. As a special bonus, the chapter entitled Using The Book and The Stories is also included. 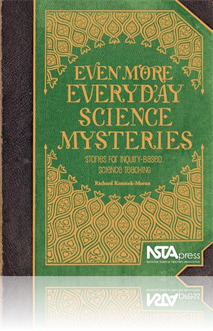 Richard Konicek-Moran has come up with 4 volumes of his Everyday Science Mysteries and this is just one example. The story here works well to introduce a discussion about vacuum and air pressure, but it can just as easily be steered toward a more general conversation about making a hypothesis. Besides the mystery story and teaching prompts readers also receive the preface and introduction to the book, including a chart that aligns the Konicek-Moran's stories with Peg Keeley's Uncovering Student Ideas volumes. They are fantastic together!